The Société des alcools du Québec and HEC Montréal announced a new initiative this morning: the SAQ–HEC Montréal Program in Retail Management. This strategic partnership between the corporation and the School is intended to provide retail managers and owners with better tools, to help them meet today’s substantial challenges and keep their businesses profitable and thriving. The intensive 45-hour program is divided up into five modules, with one module every three weeks. It explores the various aspects of retail management from the point of view of managers and owner-operators. The content will be taught by experts from the retail industry, HEC Montréal professors and veteran consultants, chosen for their superior skills in the course material and the retail industry in general. “This association with the SAQ will allow the School to offer a program closely suited to participants’ needs, to help them acquire and improve the management knowledge and skills essential to retail trade,” explains Marketing Professor Robert Desormeaux , Director of the new program. The program will look at different aspects of marketing, from strategy to the client’s experience. It will also deal with finance, control, operations management, procurement, human resources management and leadership. Louise Faubert, of the Quebec Department of economic development, innovation and export, helped develop the program and is acting as a special advisor to HEC Montréal. 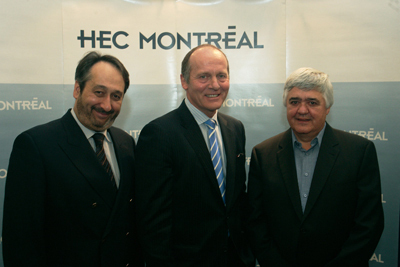 The SAQ is pleased to be part of this SAQ–HEC Montréal Program in Retail Management. Philippe Duval, President and CEO of the SAQ, emphasized its commitment to developing the retail profession. “This training is sure to help create more effective managers, to advance knowledge and share best practices in the industry. It is also a message to tomorrow’s managers, assuring them that a career in retail is not only possible, but also exciting and full of challenges,” said Mr. Duval.